I like Vietnamese Sandwiches (Banh Mi). They are traditionally inexpensive and great for a quick lunch or snack. When DD Mau opened up in trendy and super expensive Yaletown I was concerned. Could an eatery that serves an ordinarily inexpensive food item survive in such a ritzy neighborhood? When I ordered and received my cold cut Vietnamese sandwich from DD Mau, I realize that they were going to differentiate themselves by going the non-traditional route. First the sandwich was wrapped in kraft colour butcher paper (a proprietor’s attempt to signify quality, see my Finch’s post) instead of the square white wax paper that most Banh Mi in Vancouver comes in. Instead of using the submarine sized baguettes universal amongst other Banh mi purveyors, they use a baton like baguette similar to the ones used by the Dirty Apron in their sandwiches. The DD Mau baguette is crispy on the outside and soft on the inside. It is denser than the common airy banh mi baguette but it is still good bread. I leafed thru the filling like pages from a book. I was impressed with both quality and quantity of the ingredients. It contained 3 types of Vietnamese cold cuts I could recognize: Vietnamese Ham/ Pork Roll (chả lua), Vietnamese headcheese (giò thu) and Vietnamese Cured Pork Ham (Thit Nguoi). The last cold cut looked like the Pork Roll with chunks of cured pork ham. The Vietnamese headcheese had black bits in it, which I’ve never seen before. Upon research I realized it was probably black wood ear fungus and it’s use is widespread in traditional Vietnamese headcheese. I wonder why I never seen it before since it’s seem like a fairly standard component in gio thu? I appreciated that DD Mau doesn’t skimp on the vegetables. The tartness of the pickled carrots and daikon are important but often overlooked. They balance off the heaviness of the meat fillings. In addition to being sour, the pickled carrots and daikon also had a bit of a spicy kick. Cucumbers and cilantro rounded off the plant portion of the filling. Bookending the sandwich was pate which on the DD Mau website states is house made. The pate was not as heavy as other renditions I’ve had before. This was tasty sandwich and its flavor is comparable to the other Banh Mi in town. 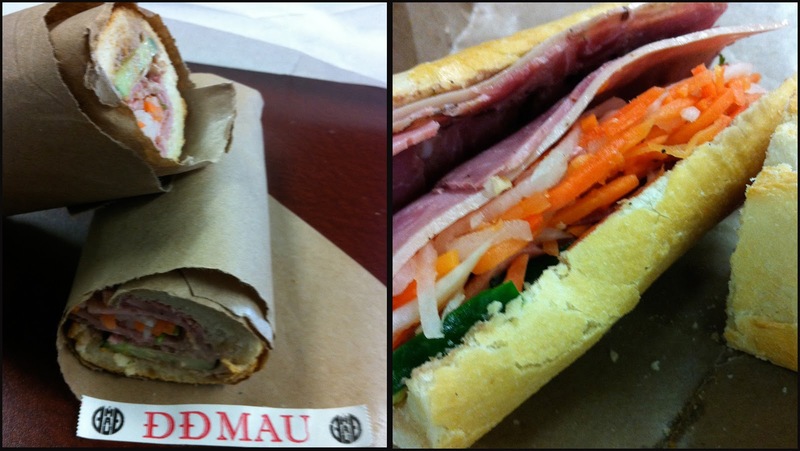 Normally I need to eat 1.5 east Van Vietnamese subs to be full but I was completely satisfied with just the one from DD Mau, which I didn’t expect. I think the denser bread and more bountiful filling was the difference in quelling the hunger pains. Is DD Mau going to make it in Yaletown? All the tweaks they made to their sandwiches were designed to compete with the sandwiches in downtown. The butcher paper and sleek baguette are stylistic and appeals to the sensibilities of the downtown crowd. The quality, quantity and tastiness of the fillings puts it on par with the standards set by Meat & Bread, Finch’s and Dirty Apron. Most importantly at $7 per standard sandwich, DD Mau is actually cheaper than their competitors by about $1 – $2. However here’s the rub, it maybe cheap by downtown standards but a lot of people are aware that this type of fare cost 50% less in East Van. To be honest I was a little apprehensive about its value too. However, given that the quality of the ingredients and the fact I normally have to buy 2 sandwiches to be full, the value presented by DD Mau is not as far off in comparison to their East Vancouver counterparts. In the end, I hope DD Mau thrives in Yaletown. 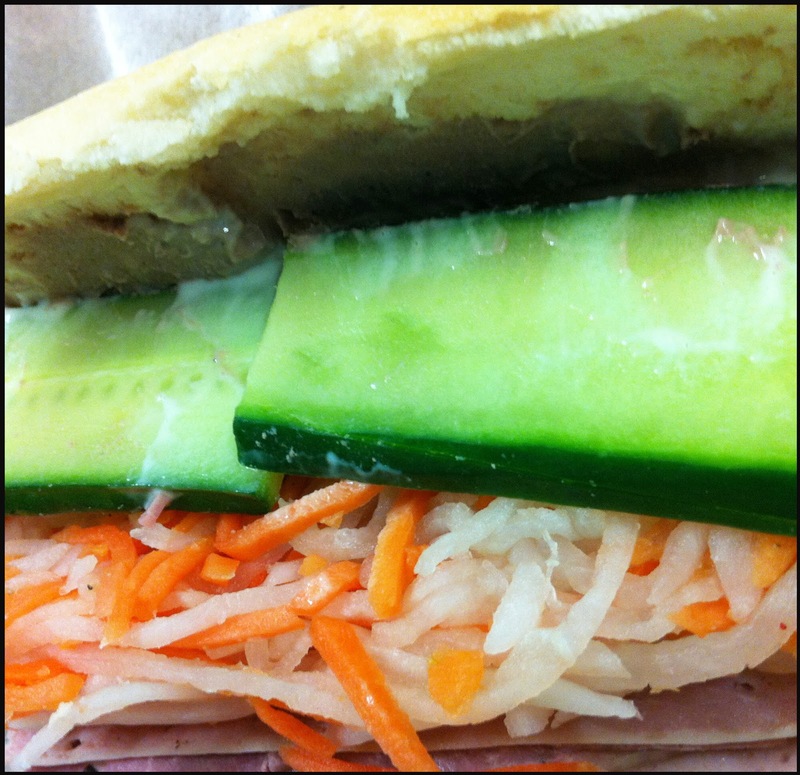 Its Cold Cut Sandwich is very delicious and a welcomed addition as it diversifies the lunch options available in the area. Previous Post Food for Thought: When does Bastardization become the new Normal?